AnyMP4 DVD to iPad Converter for Mac is the best software to help you convert all kinds of DVD movies to iPad H.264, M4V, MP4 and MOV videos. And you can use it to extract audios from DVD and convert them to your needed audio format like AAC, AC3, MP3, etc. with excellent quality.. Besides, this DVD to iPad Converter for Mac has the functions of cropping the frame of the video, trimming the video length by setting the start point and the end point, adding image/text watermark to the video file and merging several clips into one file. Apart from that, this program compatible with the latest iOS 7 and iPhone 5S/5C, iPod, iPad. With this AnyMP4 DVD to iPad Converter for Mac, you are able convert any DVD movies to almost all popular video formats which are supported by iPad, and these video formats include H.264, MPEG-4, MP4, MOV, M4V and more. Besides, it supports any version portable Apple devices. AnyMP4 DVD to iPad Converter for Mac enables you to extract audio track from DVD and convert them to your needed audio format like AAC, AC3, MP3 and so forth. 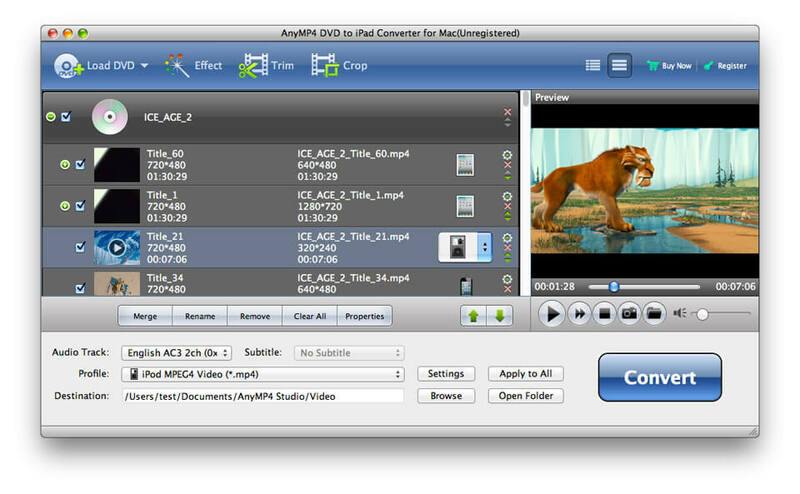 AnyMP4 DVD to iPad Converter for Mac enables you to trim the video to your needed length by setting the start and the end time. And you can also crop the video frame as you like. Besides, this DVD to iPad Converter allows you to add text or picture watermark to video, merge DVD video clips into one and so on. With it, you can select your preferred audio track and subtitle to replace the original ones if the source DVD has several audio tracks and subtitles. Output parameters such as Video Bitrate, Resolution, Encoder, Frame Rate and Aspect Ratio are also available for you to adjust.